We’d love your help. 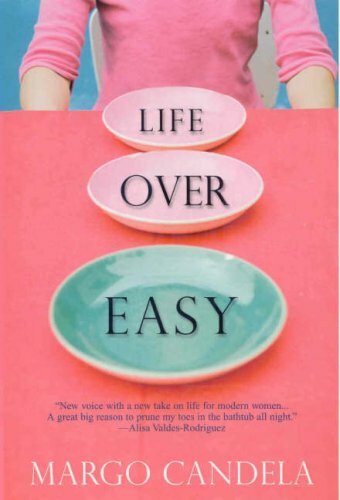 Let us know what’s wrong with this preview of Life Over Easy by Margo Candela. When her live-in boyfriend leaves her, super-organised Natalya embarks on an adventure which sees her join a gym, read more cookbooks, volunteer to clean up an oil spill and try to rediscover her spirituality by going to church. Along the way she meets a diverse cast of characters and gets into some sticky situations. To ask other readers questions about Life Over Easy, please sign up. In Margo Candela's second novel, we meet Natalya, Margo's second strong, complex Latina character, complete with a loud, loving family, a serious boyfriend, a successful catering business, and comadres who have her back. When life throws her a curveball, Natalya has to decide how to pick up the pieces. She uses everything from lists, songs, exercise, transition men, and her comadres to get a handle on how to move on and get over the man who dumped her. Her mother is forever hopeful and her father loves her in his own silent way. Her girlfriends are all complicated, but the bonds run deep with this crew and they will be there for each other, no matter what…that's what comadres are for. As she transitions from her tranquil, but not truly satisfying life, Natalya discovers an inner strength she did not know she had, explores a sense of spirituality that agrees with her, and realizes that life is her for the taking. Natalya blossoms into a wonderfully complex mixture of love, understanding, and caring in her year of reorganizing her life and learning how to take back what is hers. 1. Natalya writes down her perfect recipe for a man. Read over her recipe, what would you add, change, delete, or otherwise alter? 2. Are you ready to be the perfect mate for your perfect mate? 3. Write your goals for a better you and share with at least one comadre. 4. How do you pick up the pieces of your life after life has dealt you a blow? 5. Write a list of New Year's Resolutions based on life's pleasures. 6. What is your favorite break-up song? Why are songs such a powerful part of breaking up? After waiting ten minutes outside the restaurant, I finally approach the hostess. A slight twist on a typical "chick lit" novel. For a change, the main character is latina, so the family dynamic of growing up in that culture is intrinsic to the storyline. Besides that twist, however, you are faced with the general formula these novels tend to follow. Still, this one managed to have less of the self-pitying "woe is me, I'm a girl without a boy" feel, and more of the "I am woman, hear me roar...well...purr" as I stumble and fall, but pick myself up again and do it all over. I en A slight twist on a typical "chick lit" novel. For a change, the main character is latina, so the family dynamic of growing up in that culture is intrinsic to the storyline. Besides that twist, however, you are faced with the general formula these novels tend to follow. Still, this one managed to have less of the self-pitying "woe is me, I'm a girl without a boy" feel, and more of the "I am woman, hear me roar...well...purr" as I stumble and fall, but pick myself up again and do it all over. Recommended to Martha by: Leny B. A quick fun read about how a hispanic single girl ends up learning that it's more important to find yourself first rather than a man; this of course only occurs after she juggles dating four men at once:)Thanks Leny! A fairly typical "chick lit" book. I had a difficult time relating to the main character and the situations she found herself in. However, it was a relatively entertaining book and I would definitely consider reading this author again, even though I'm not a chick lit fan at all. this book reminds me that life is a journey. worth reading. Cute, but just okay for me. A break-up/growth type book but very very light. This is a light hearted silly read, but it was enjoyable. Bit messy, all over the place. Entertaining and funny at times. Finally gave up around page 80... just couldn't get into this book. This book was easy reading and entertaining. If you want to read something light and fun this book was pretty good.